So many things changed after becoming a mom. Interests, clothing, hair (just thankful to have it these days), car (I am completely loving the minivan life), and my love of roller coasters (vanished. completely.) I kind of expected a lot of those things, but there were some unexpected changes too. As a photographer I have always had definite opinions on the worth of certain photos over others. I wanted perfect images, magazine quality shots. But then I became a mother. And I watched my daughter grow, passing through seasons and phases, and I realized that the images I wanted to save and print weren't those which I struggled through tears to achieve. They weren't the ones of her wearing the perfect little outfit that was itchy and she hated. They weren't the ones that came at the cost of family arguments and strife over getting "one more shot" in attempt for what I envisioned. Those memories make me cringe now. No, they are the ones with her wearing her tutu and her owl snow cap in the dead of summer. The ones of her twirling her umbrella in the rain wearing the loud striped leggings she insisted on wearing every day for 2 months. The the ones with her grubby little hands clutching watermelon sitting next to her sweet Papa. These images, representing her in different seasons, interacting and growing with those around her--were the ones that tugged at my heartstrings. And somewhere along the past five years I've largely given up on taking family portraits like I wanted in the beginning. And because me holding my heavy Canon camera made me feel like I need a certain result, I gave up using it and have almost entirely used my iPhone lately. Until today. I've come to the point where I want to capture my chickadees as they are, and today I picked up my "real" camera and began a new journey. 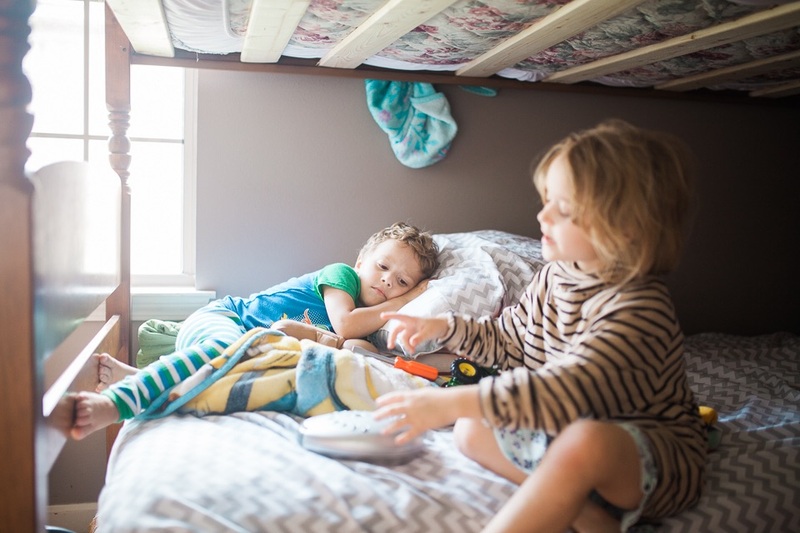 So why should you begin photographing your kids in your messy house? 1. It's the home you live in today. What better place to document your current season of life. 2. Its convenient because it already houses the bunk bed that serves as fort and trampoline, the books with taped pages, and the blocks that are both building toys and missiles. 3. It's the true backdrop for learning and developing the little persons that it shelters, and watching them become best friends with others. 4. The worn-with-love baby doll and the mismatched clothing is what you want to remember, because it is what will not stay. They have the rest of their lives to try and look perfectly--let them be little and cherish it now.